Last year, Emerald Green was declared as the colour of 2013 by colour corporation Pantone. Who knew that it would turn out to be so well accepted and become such a craze. For me, it's been one of my favourite colours and so I got one more reason to hoard on this colour this year ;) Who doesn't wanna be dressed in the colour of the year? While Statement necklaces have been around for a while, I'm liking the transition from wood and plastic to more chunkier metallic pieces. The thick gold chain with a tribal influenced pendant, diamanté stones and metallic studs all added to the chunky appeal of the necklace that I wore with the lovely emerald green top, both from Romwe for my sister-in-law's house-warming karaoke party. The top looks nice on u! Nice outfit! everything gelled very well! Love the top n necklace..absolutely gorgeous. 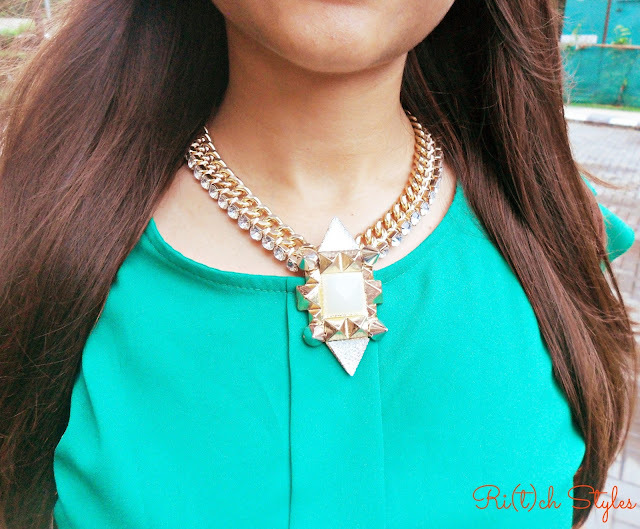 Love the combo and the statement necklace is fab! Green is your colour! You look fab! It is superb neckless but I think it is too heavy.. only occasion usable... but your Emerald Green is looking so fantastic on you.